Check: variation of NHC carbene , a type of carbene that is stable at ambient temperature and can be isolated. In the regular NHC carbene carbon is flanked by two nitrogen atoms, in the aNHC it is just one. Requires steric protection by bulky diisopropylphenyl (dip) ligands. Central ring planar with 1.5 bond order bond lenghts consistent with ring delocalization. 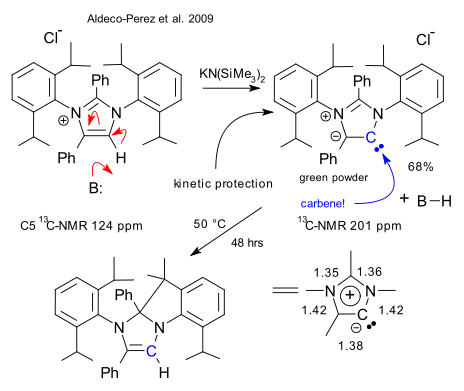 carbon NMR also indicates carbene.